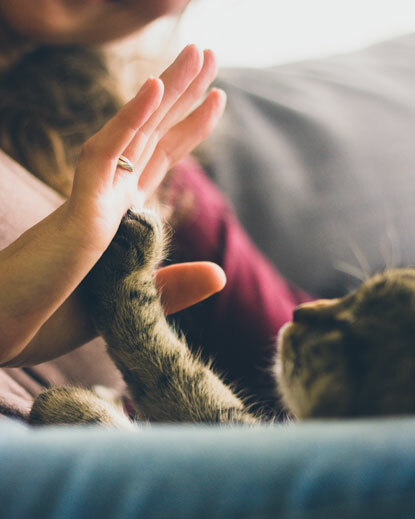 When they’re reaching for their favourite toy or a tasty treat, you may have noticed that your cat prefers to use a particular paw. According to new research, their preference may actually be down to their gender, with female moggies more likely to use their right paw and males more likely to use their left. Researchers at Queen’s University Belfast studied 24 male and 20 female cats as they went about their everyday activities at home. They observed the cats as they were reaching for food, stepping down the stairs, or stepping over objects, and noticed that the majority were consistent in using a particular paw for the task. The male cats showed a significant preference for using their left paw, while the female cats were more inclined to use their right. Unsurprising the cats did not seem to have a preference when sleeping, as they would happy snooze while lying on either side of their body! Further study is needed to determine why gender plays a role, but the researchers believe it could be down to hormones. She added: “We have just discovered that left-limbed dogs, for example, are more pessimistic in their outlook than right-limbed dogs. From a pet owner's perspective, it might be useful to know if an animal is left or right limb dominant, as it may help them gauge how vulnerable that individual is to stressful situations." Have you noticed whether your cat is left- or right-pawed? And do they prefer using the paw typical for their gender? Let us know in the comments below or on our Facebook and Twitter pages! We’d love to see photo evidence too!